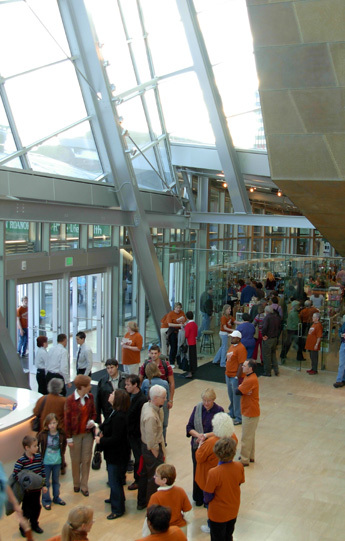 The museum fielded a small army of volunteers in burnt-orange T-shirts to help with ticketing and crowd control and answer questions on opening day. But the best question may have come the day before, as volunteer Susan Shortridge worked the museum's hospitality table at Hotel Roanoke. Someone asked Shortridge if the opening of the museum was the biggest thing happening in Roanoke this weekend, she recalled. D'oh! "I said, 'This is the biggest thing that's happened in Roanoke in 40 years!' 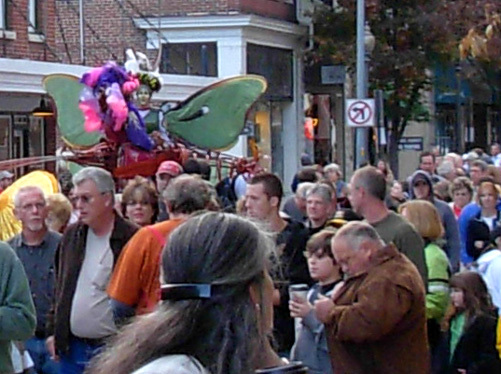 "
That's rather amusing to relative newcomers like us who moved to Roanoke from other areas of the country. And now I'm curious what happened here forty years ago! I've lived in a variety of environments during my life -- a sleepy little rural area east of Cincinnati growing up; bustling, intellectually-stimulating Columbus, Ohio during college; the dynamic, progressive, international Atlanta area for twenty-five years; and much smaller, wild-western Billings, Montana for five years before moving to the southern Appalachian region near Roanoke. Each rural, suburban, and urban area had its own history, culture, style, ethnic mix, proportion of "natives," and ways of adapting to progress. Since moving to the Roanoke area in 2004 it's been interesting to watch the locals wrestle with various civic challenges that have arisen. There's the stadium that had to be torn down four years ago after a bad flood; the city and its residents still can't figure out how best to use that land. There are the venerable old City Market Building and the cultural Center in the Square downtown that both need interior renovations; both projects are mired in indecision and controversy. Young professionals and other visionaries keep coming up with innovative solutions to problems, and suggestions to attract and retain other young professionals and visionaries . . . and they continue to be stymied by those who object to change. 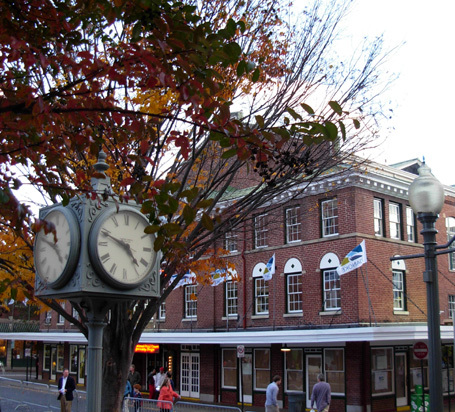 Despite a new medical school being built downtown and the intellectual vibrancy of the nearby "Tech Corridor" in Blacksburg and Christiansburg, Roanoke generally seems to cling to its railroad legacy and resist efforts toward modernization. 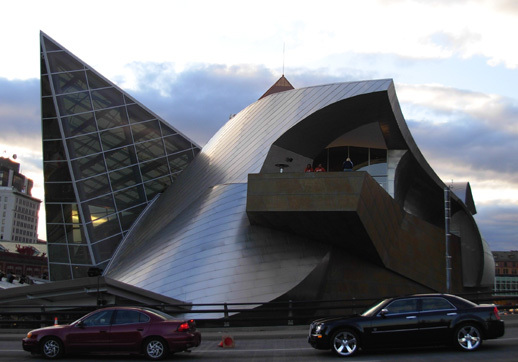 It's a wonder the stunning Taubman Museum of Art was even built here, considering the lather some folks worked themselves into! I suppose it was easier than some of the other stalled projects because most or all of the funding is private, not public. 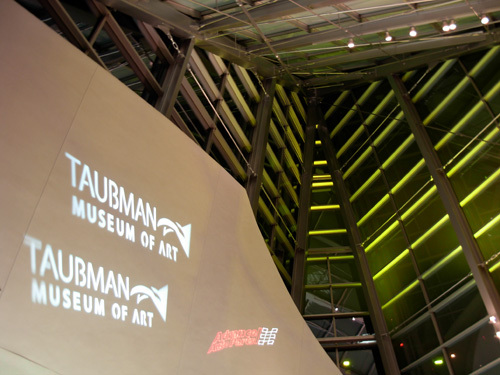 Appropriately, the museum is named for its largest donors, Jenny and Nicholas Taubman. Jenny spearheaded the fund-raising efforts for the $66 million project; she persuaded her husband, former CEO of Advanced Auto Parts, to make the largest contribution (rumored to be $25 million). that pays subtle tribute to Advanced Auto Parts. Another photo I took credits a local TV station. 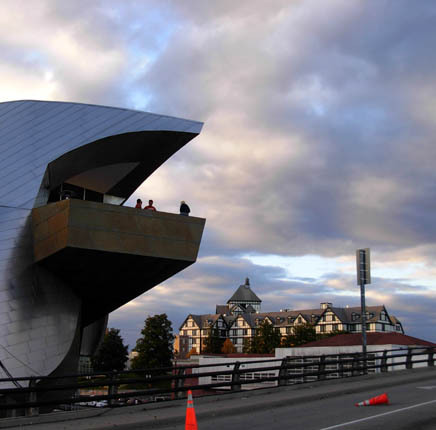 I've been anxiously awaiting opening day of the new museum since I first saw artist's renderings of the striking structure that would replace the woefully inadequate Art Museum of Western Virginia a few blocks away. 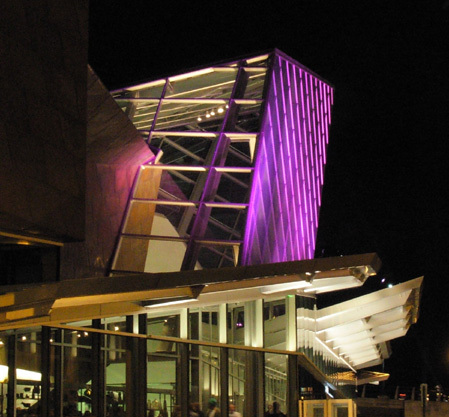 I remember how excited I was when the High Museum of Art opened in Atlanta in 1983 -- what a beautiful, contemporary building! But it was not such an anomaly in that city with its wide range of architecture. 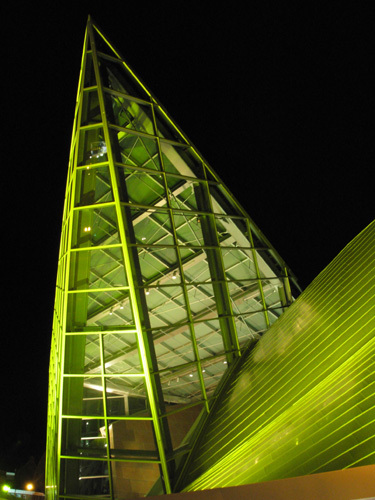 The dramatic museum design by Los Angeles architect Randall Stout quickly divided Roanoke residents into two camps: those who detested the radical design as out of place in their fair city (it was called everything from "a monstrosity" to "the Wreck of the Flying Nun") and those who eagerly sought a dynamic symbol of progress and culture in this part of the state. When Jim and I were trying to decide our departure date for this winter's sunbird trip to Arizona, my main criteria was that it be after the November 8 opening of the museum. I simply didn't want to miss it. 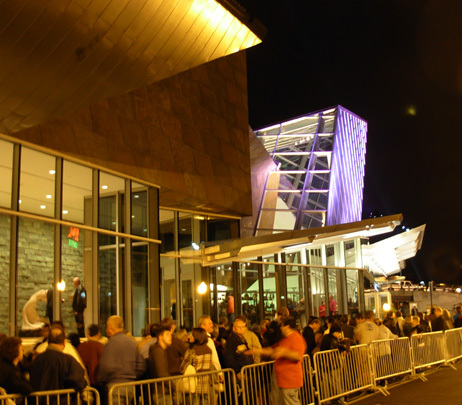 Neither did over 10,000 other visitors who enjoyed a free tour of the new museum on Saturday. Many folks now have a different perspective, literally and figuratively, of the structure after learning more about its design and seeing the beautiful spaces and art inside. Not that everyone has accepted the new museum, but at least now there are many more letters of praise than criticism in the local paper and its web site. 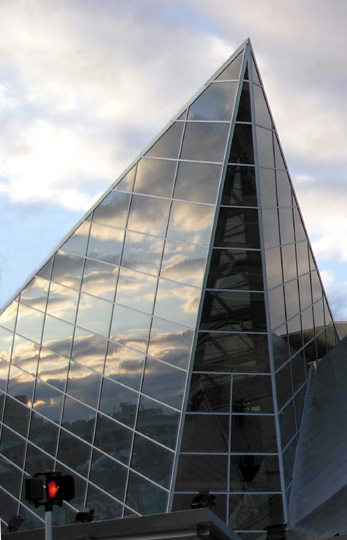 Some people hope the ultra-modern building will transform Roanoke in the same manner the Guggenheim Museum in Bilbao, Spain, helped turn that city into an international tourist destination. 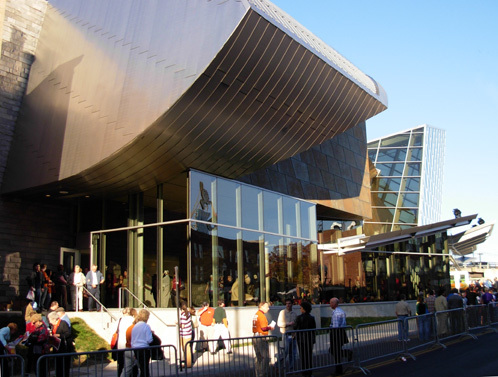 I doubt that will happen any time soon in Roanoke, but I hope the museum will create some momentum toward other improvements in the city and region. 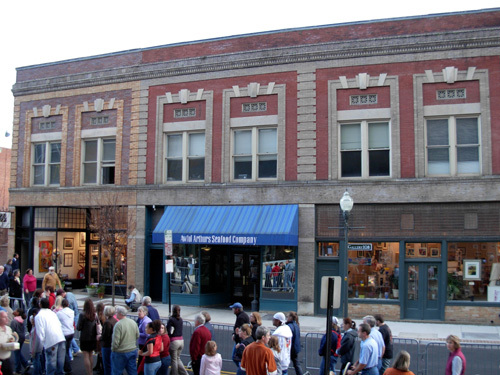 The arts community has already grown in response to the new museum, upscale condos are being built downtown, new businesses are opening despite the dismal economy, and the nearby historic Hotel Roanoke has announced a $25 million renovation. To relate this to running, perhaps this new vibrancy and enthusiasm will even hasten the completion of our segmented greenway system! It'd be nice to have all the little one- to five-mile sections connected together for longer runs, walks, and rides. That's an urban amenity valued by both current residents and newcomers considering relocating here. In this entry I'll share some of the photos I took on Saturday afternoon and evening at the grand public opening of the museum. Jim was busy all day with a fund-raiser for the Rescue Squad. We both had tickets for a 7 PM tour. I got another ticket for myself for the middle of the afternoon so I could enjoy the street festival (music, dance, and other performances like the graceful Cirikli Stilt Birds) and see the interior of the museum both in daylight and dark. I'm so glad I went in twice because there was so much to see and the building looks very different at night. It was also a bit less crowded then, which was a plus. 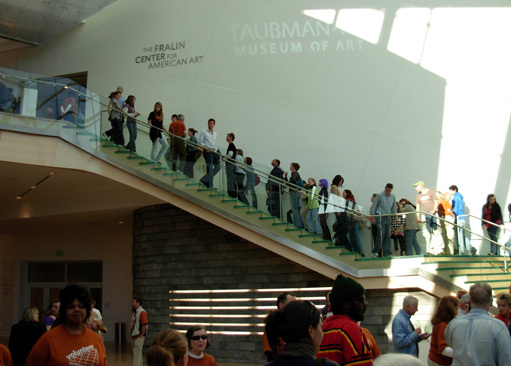 There are many professional photos of the museum and a considerable chunk of information ahout it on the official museum website at www.taubmanmuseum.org. 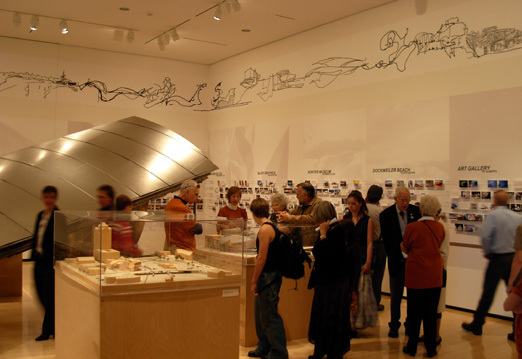 You can also find interactive displays of the museum, a tour of the inside and outside, a time-lapse of the construction, a timeline of events, and some of the art inside at artmuseum.roanoke.com, a site produced by the Roanoke Times news organization. 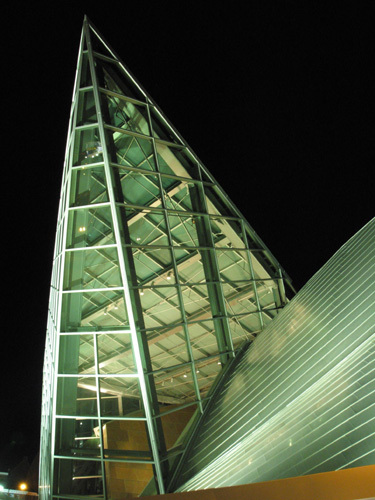 The art museum's visitors' guide and map describes the building designed by architect Randall Stout as "a dramatic composition of flowing, layered forms in steel, patinated zinc, and high-performance glass paying sculptural tribute to the famous Blue Ridge Mountains that provide Roanoke's backdrop and shape the region's spirit." 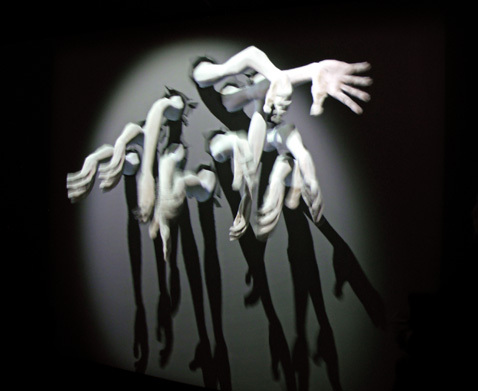 This exhibit runs through May 24, 2009. The nature metaphor Stout used fascinates me, probably because of the visceral connection I feel to mountains and water. 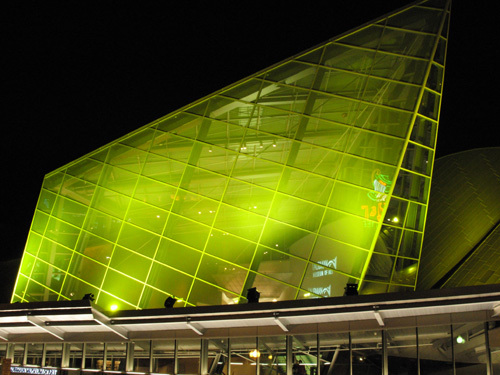 Stout spent months exploring the Roanoke Valley and nearby mountains before beginning work on his remarkable design. He envisions the building's roof as a ridgeline, its walls as rock ledges and layers of stone. Inside, the second-floor hallway curves around the eight galleries (think caves) like a river bed or gorge. Not only was the design inspired by nature, the building itself features environmentally-friendly materials and systems. 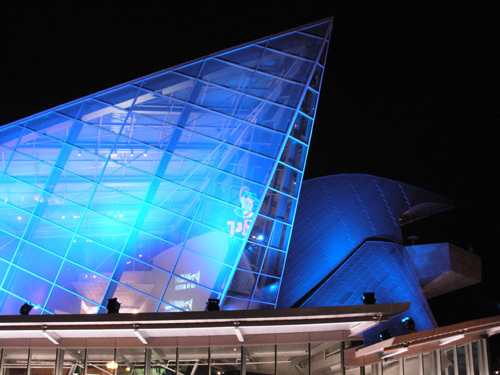 The design is very complex inside and out, reminding me of a spaceship with lots of angles and layers. Stout is known for thinking differently about spaces than most everyone else. Yet he wanted the building to be inviting and comfortable for visitors, while showcasing the museum's various collections in the best light, so to speak. Although there is considerable diffused natural light in the atrium, the second-floor galleries are designed to provide flattering artificial lighting that protects and enhances the art. As radical as it is, the building is supposed to blend in with its surroundings like that. 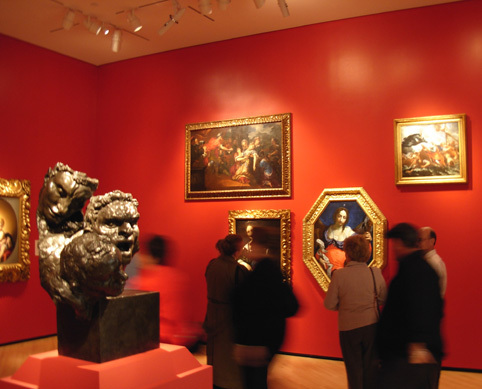 The museum has almost two thousand art objects in its permanent collection. Only a tiny fraction of them have been on display at one time in the former buildings the museum has occupied. There still isn't room to display near everything at one time, but now there is considerably more space -- and more appropriate settings -- for those permanent items, which will be rotated more frequently. 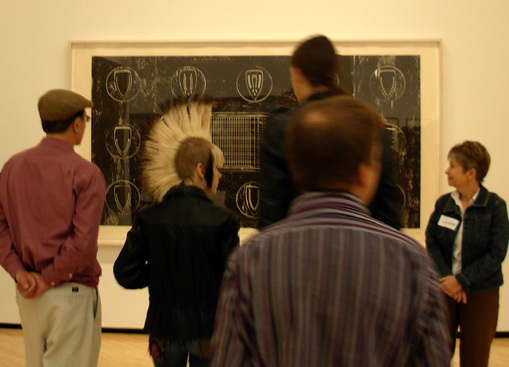 There is also room for temporary visiting exhibits in several of the eight galleries on the second floor. But let's start with the grand entrance. 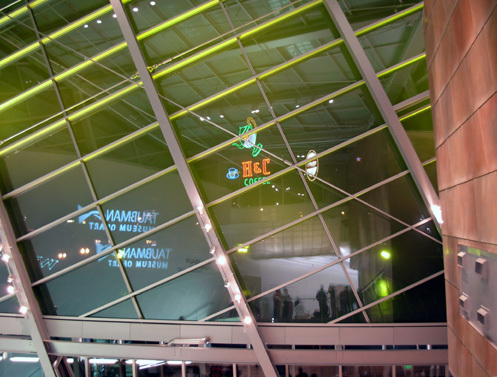 The Taubman has an airy glass atrium that allows light to permeate the large entrance lobby. 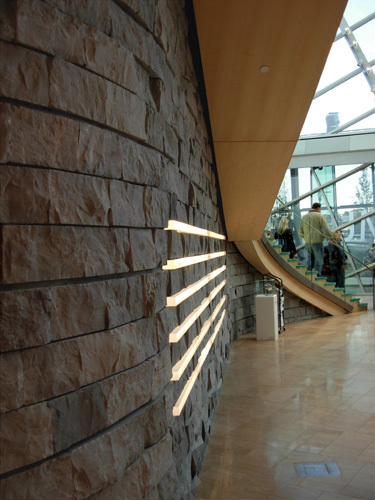 The "prow" peaks 77 feet above the Turkish travertine marble floor. You've seen the peak in several photos above. 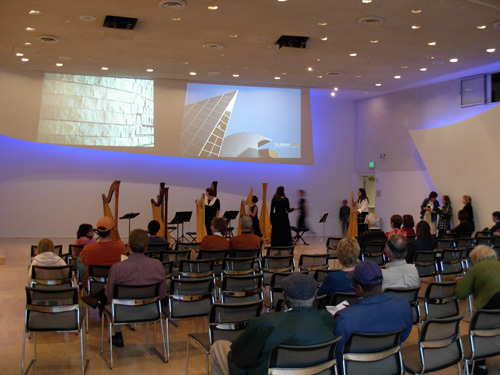 The first floor of the museum contains a theatre, Norah's Cafe (named for Norah Gibble, whose portrait by John Singer Sargent is one of the museum's signature pieces), a museum store, education studio, catering kitchen, art venture gallery, art loading dock, art storage areas, and an auditorium (below) where musicians provided entertainment on opening day:. 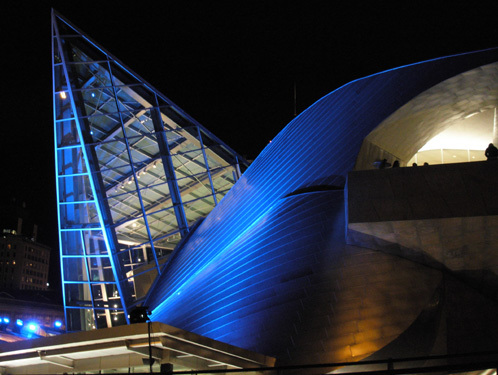 The softly lighted stairs are particularly attractive at night. The second photo at the top of this entry was also taken from the balcony. 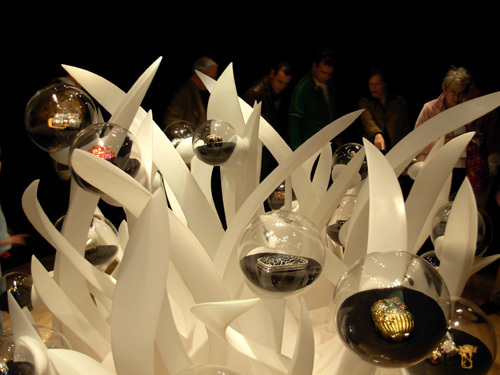 Each of the eight galleries is very different and will change in some ways by the time we return from our winter trip. Museum displays must be dynamic to keep patrons coming back. I was very happy to discover photography is allowed inside the museum as long as flash isn't used. I just set my camera to its "museum" setting -- very handy! In retrospect I wish I'd taken more photos of the art but getting good shots was difficult with so many people inside on opening day. 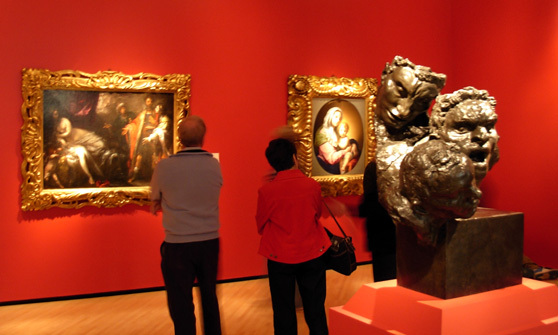 A special exhibit featuring Italian (Florentine) baroque art was shown in the REGIONAL DECORATIVE ARTS GALLERY on opening day. Arts and crafts of the southern highlands will eventually be displayed in this gallery. 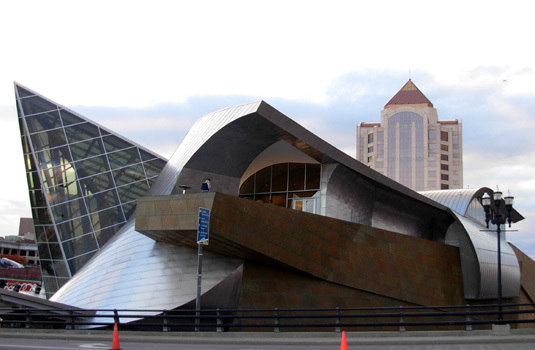 A second temporary exhibit entitled "The Cataclysmic Calm" features the evolution of the Taubman Museum from conception to final construction, as well as other works by architect Randall Stout. I already showed one view of this exhibit above (9th photo from the top). Another exhibit called "Pens and Needles: Drawings for Tattos" highlighted works of contemporary and historical body art in the REGIONAL GALLERY. My reaction to this gallery really surprised me. When one of the volunteers at the top of the stairs recommended that I visit this exhibit first, I frowned a bit and asked her why. She said I'd understand when I went through the tiny gallery. She was right. I'm one of the few women in this country who hasn't carried a purse in ten years (since I retired and didn't have to lug so much *stuff* around with me). I use a small men's nylon wallet and slip my keys and phone in my pants pockets. Very feminine, I know. Every purse I've ever owned was purely for function, not decoration. I like fairly simple, classic clothing, shoes, jewelry, furniture, art, and just about everything else. 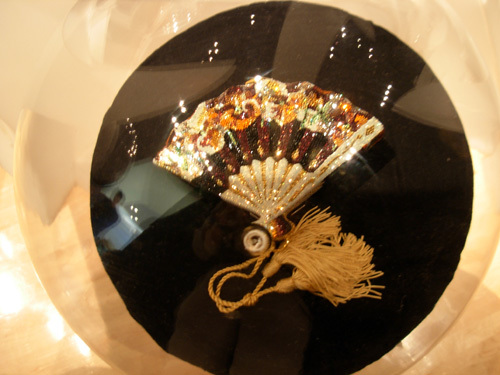 I was drawn like a moth to light by these shiny, colorful, elaborate purses. They are reminiscent of those fancy, insanely expensive Faberge eggs. I would have taken a picture of every one of them in the exquisite display if there wasn't such a long line of people to see them! Volunteers said this was the most popular gallery on opening day. 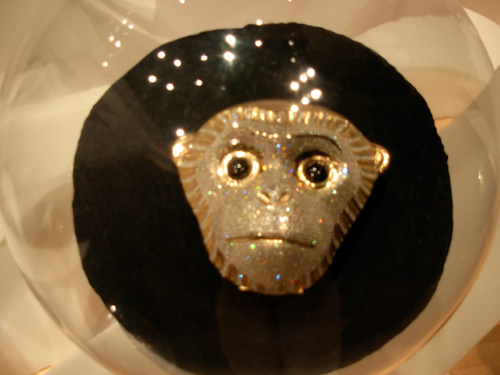 Volunteers heard lots of comments about the monkey! I plan to show more photos from inside and outside the museum on our Picasa site by the end of November. There are just too many to include here and I want to showcase the beauty and wonder of the new museum and its displays. The museum holds lots of surprises for first-time visitors and I imagine I'll see something new about the building or its contents every time I visit in the future. Here are a couple examples. The whole interplay of light and space in the museum is a continuous surprise in itself. There are so many interesting little details to notice that it's impossible to experience all of them in one visit. Probably the biggest surprise of the art itself on opening day was the lifelike stuffed figurines by artist Mark Jenkins. Like most visitors, I was concerned Saturday afternoon when I first saw a man lying on the floor facing the wall in the ornate Italian baroque gallery. Several people were gathered around him, and one hurried out to notify a volunteer at the door. 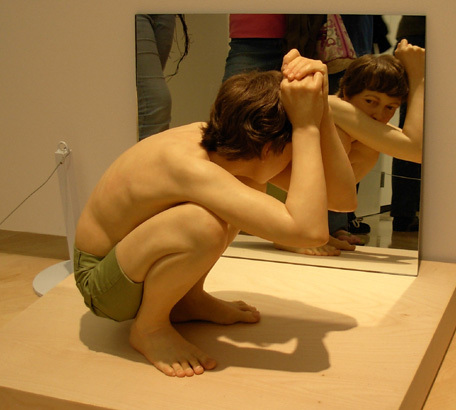 When people started giggling and poking the poor fella, I realized this was art, not life and death! On our way back in to town that evening, I told Jim about the unconscious man but didn't tell him it was art. I was hoping he'd realize that when he first saw him lying in the same place I'd seen him four hours earlier -- and not rush to give him CPR! I stayed behind Jim as we entered the gallery. 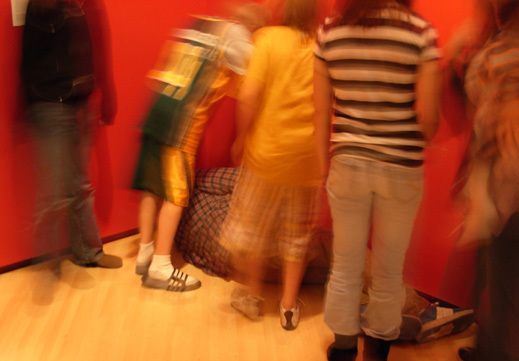 Yep, there was the same "man" on the floor, surrounded by new victims of the museum's prank! Jim was a bit startled, then put two and two together and realized the guy wasn't real. He looked around to see my expression. Yes, I was laughing. I thought the whole thing was pretty funny. You can see her in several photos in this entry. Several alarmed people driving under the balcony on Williamson Road called 911 during the day, reporting a possible suicide attempt! 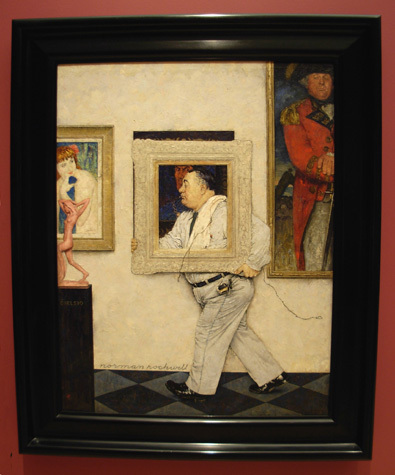 Museum staff finally turned the figure around so "she" faced the building and not the street -- and the calls stopped. 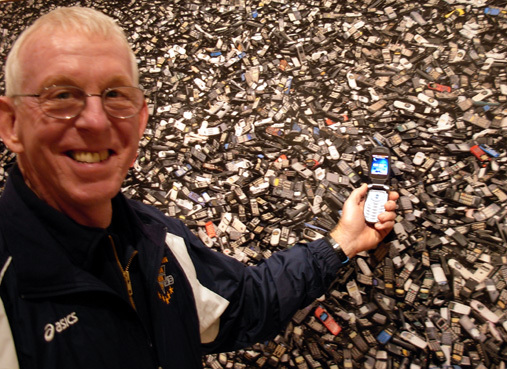 At least one man who called 911 was not amused when told that it was "art." He sent an angry letter to the newspaper about it. (He probably still thinks the building is a monstrosity, too.) I'm not sure what the emergency operators thought about all this, but I hope they were clued into the joke before sending out any first responders. And so the Roanoke Valley has been thoroughly shaken up, in a good way (my opinion, at least). I'm proud of the visionaries who saw the need for a fine new art museum, the patrons who contributed $66 million to build it, and the people who will continue to support it. It's just one more thing for me to love about Roanoke. 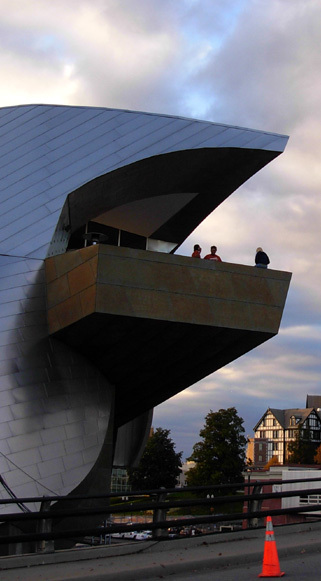 It remains to be seen how large of an impact the Taubman Museum of Art will have on local citizens and whether it will be the cultural tourist draw its advocates expect. 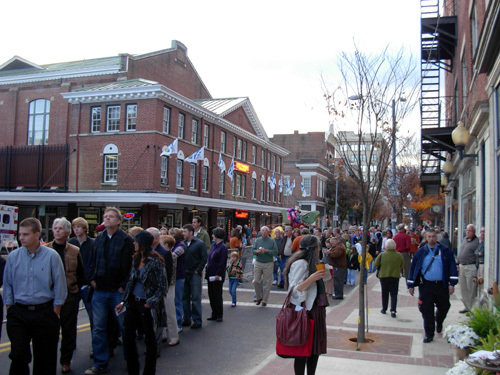 Between the burgeoning arts community and the new medical school and related facilities, Roanoke is becoming more attractive to young and old alike -- those who left and are coming back, those who considered leaving but decided to stay, those who have chosen to move here from elsewhere to work or retire. 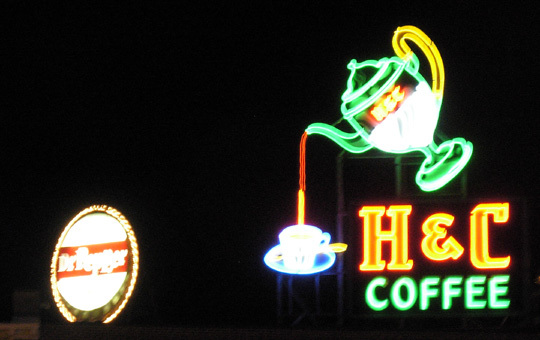 Roanoke isn't just a railroad town any more. The museum staff has many creative projects in store for us. 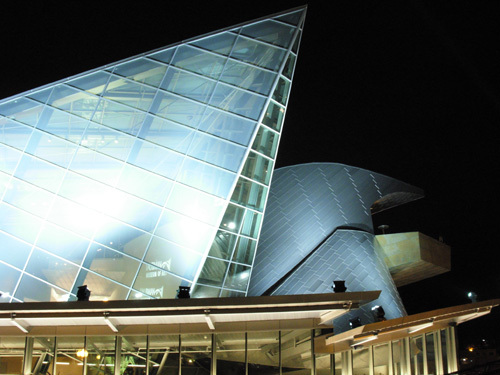 As stated in the Users Guide published by the Roanoke Times for the opening, "The Taubman Museum is not just a repository for valuable art. 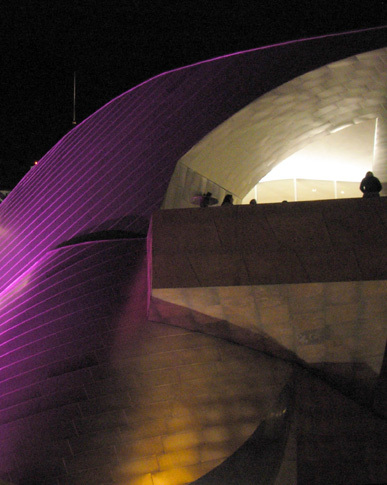 It is also a living, changing cultural enterprise with a host of programs catering to a varied clientele. 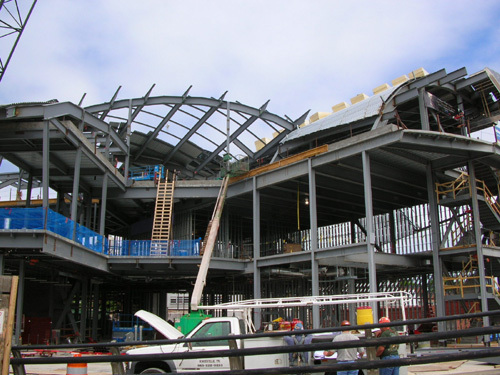 The museum will have educational programs for children and adults, lectures, music, film, children's live theater and other features . 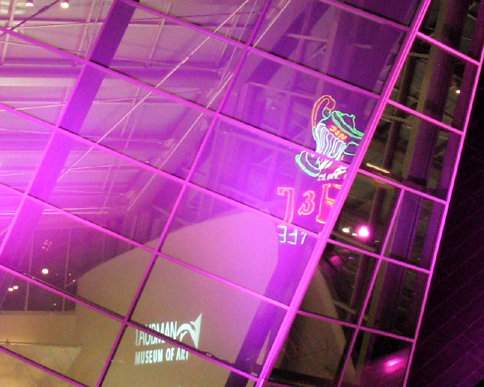 . ."
All the exhibits and programs will be designed to educate, entertain, and attract more people to the museum. I don't need much persuasion to become a patron myself. I hope people will be enticed to visit from all over the world and see what else makes the Roanoke Valley so special. When I lived in Atlanta I volunteered for a variety of organizations. I haven't done much of that in the Roanoke area because we live so far out from the city and we travel so much. Some of the work I'd like to resume, such as pet therapy with Cody at a nursing homes, requires more continuity with the clients than I can offer right now. I'm so impressed with the new museum, however, that I'd like to volunteer there in some capacity when we return home in February. I'll do what I can when I'm available. I'd like to be more of a part of the organization than just being an occasional visitor. Next entry: speaking of traveling . . . it's about time for us to hit the road again!